This week's content brought to you by Adam Augusiak-Boro. In our newsletter from last week, we discussed the relatively solid 2018 IPO market, which has seen 176 IPOs price through today, as well as some of the potential blockbuster IPOs coming up in 2019, like Uber, Lyft and Palantir. Only a few days later, however, and it looks like the public equities markets, in particular tech stocks, have fallen off a cliff and are putting 2019 IPO activity into question if this really is the beginning of a longer-term downward trend. 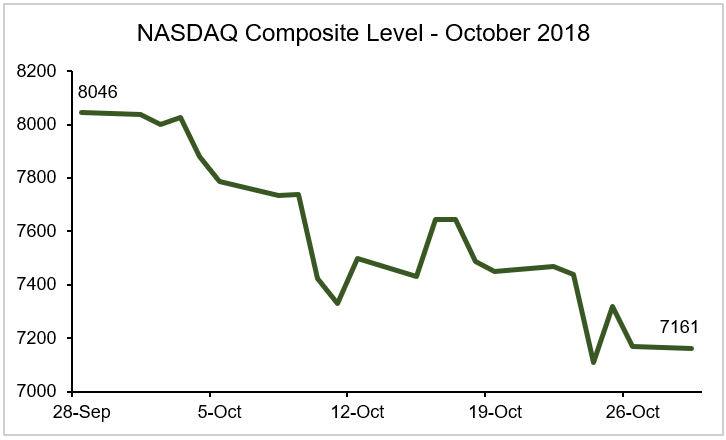 In October so far, the NASDAQ Composite, which is heavily weighted towards technology, has dropped nearly 900 points since the beginning of the month. The nearly 900 point or 11% drop marks the NASDAQ’s worst monthly performance since November 2008, only a couple months after the collapse of Lehman Bros. Leading the downward charge are unsurprisingly some of the FAANG stocks (Facebook, Apple, Amazon, Netflix and Alphabet’s Google). Netflix has fallen 14% since reporting earnings in mid-October, despite handily exceeding analysts' expectations. Amazon and Alphabet also suffered heavy losses at the end of last week after both companies reported beating earnings but missing revenue estimates. Apple and Facebook are set to release earnings later this week, potentially adding more pain to big tech’s recent market performance. However, strong reports from both companies may not spare them from the market turmoil, with even Netflix succumbing despite beating earnings estimates by over 20 cents. What’s driving the market into correction territory? Ongoing trade war. President Trump’s tariffs on certain Chinese goods seem to finally be inflicting some economic damage on the Chinese economy. Over $250 billion in Chinese exports have been hit with tariffs thus far, with 10% tariffs imposed on $200 billion in goods last month set to increase to 25%. A monthly survey of Chinese manufacturers, shipping agents and trading companies showed that export volumes grew far more slowly in October, with 2% of the 205 companies surveyed saying the trade dispute was negative or very negative. Higher rates and winddown of stimulus programs. At least in the United States, it appears that the economy remains relatively stable. Recent data have shown that Americans’ personal spending and incomes picked up in September, and the U.S. economy grew a faster-than-expected 3.5% in the third quarter. However, with interest rates on the rise in the U.S. and an impending end to crisis-era stimulus practices in the eurozone, there is concern that market and economic gains will not be sustained. Tech backlash. Recent data scandals at Facebook, Google, and Twitter, among others, have contributed to a growing consumer and government backlash against the tech industry that has come to manifest itself in governmental action. Notably, 2018 is the year the European Union’s General Data Protection Regulation (G.D.P.R.) came into effect, which forces companies to adhere to certain guidelines when it comes to the use and storage of people’s data. These new regulations could lead to substantial fines for those who break the rules and may have negative impacts on tech companies’ ability to earn targeted ad revenue. The tech backlash may also lead to other negative financial consequences for big tech—just yesterday, the British government announced that it will implement a new 2% tax on technology companies earning over 500 million GBP in revenue a year. While Europe is leading the charge in taxing and regulating big tech, similar sentiments in the U.S. are leading to calls for increased regulations here as well. The tech industry, which propelled U.S. stock indices to record highs in 2018, undoubtedly faces some challenges as we head into 2019. All of a sudden, highly anticipated IPOs for Uber, Lyft, and Palantir, among others, seem more precarious. While we’re not convinced that this is necessarily the beginning of a sustained down market, we think recent market volatility may push a few companies that were entertaining an IPO in 2019 back onto the sidelines. For companies that gave clear messages that they intend to IPO next year, such as Uber and Lyft, we believe they’ll continue to march ahead but probably with greater speed now that the bull market’s run appears shakier.